Barcelona Central Garden i Barcelona, Spania: Bestill nå! Cancellation or modification of large group bookings must be made at least 1 week prior to arrival. The pending balance for the entire stay may be charged on failure to notify us in time. Once the booking has been paid, it is not refundable. This is not a Party Hostel. Everyone must respect the hostel rules regarding noise disturbances and behavior out of courtesy of other guests and neighbors. This Hostel don't accept Hen & Stag Bachelor parties. Underage people should be accompanied by at least one adult responsible for the group. The following group types are not accepted by this hostel: Holiday with Friends, Stag/Hen/Bachelor Party, Sports Group If you have misrepresented the type of group you are booking for, your booking may be cancelled by the hostel." 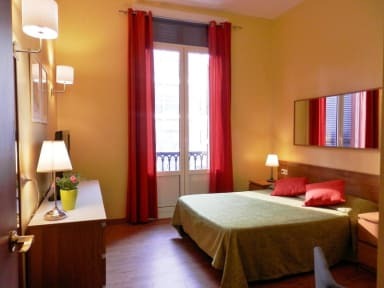 BCG is an attractive middle sized hostel located just 3 blocks away from Plaza Catalunya. 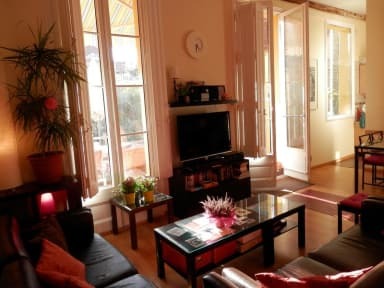 It is a safe, friendly, clean and relaxing home away from home for genuine travelers and families. It is the perfect place to enjoy the city, with opportunity to meet new people and feel truly at home. This is not a “party hostel'. We have a comfortable lounge and kitchen area that face onto a beautiful outdoor garden terrace. Our staff are friendly & enthusiastic travelers who enjoy hosting social nights (such us Flamenco or Tapas nights) and helping to organize sightseeing activities. Out of those hours, you may leave your luggage in our storage room, free of charge, while you go out to explore the city. Non-refundable rates: If you have booked a "non-refundable rate" you only need to inform us of your approximate arrival time, and we will coordinate your check-in. No problem. Deposit-Only rates: As for the rest of the reservations, if guests arrive after 10 pm, they must request a "late-check-in service". Our hostel usually doesn’t charge late-check-in fees, however, the cost of the first 2 nights will be charged in order to arrange a late-check-in (which means that we will maintain all of the beds reserved and have someone waiting until the next day at 9 am in case guests have experienced any delays). If the guests don't show up by the next morning, the reservation will be cancelled and the money won't be reimbursed. AGE LIMIT FOR SHARED DORMS: Being a 'Youth Hostel', our shared mixed rooms are meant to be 'student dorms'. For that reason, children under 7 or guests over 45 years must book private rooms or entire dorms (all beds in a shared dorm). Please, contact us immediately if this concerns you, so that we can assist you. ATTENTION: We can't accept Bachelor Parties as we are NOT A PARTY HOSTEL. BARCELONA TOURIST TAX: The local Government charges a Tourist tax to all visitors over 15 years old. This tax will be calculated upon arrival according to city regulations. This option requires the full cost of the stay to be paid in advance in order to complete the booking process and confirm the reservation. This rate is cheaper, but it cannot be cancelled or modified (consequently, paid amounts cannot be reimbursed). These reservations can be cancelled (or modified) until 5 full days before the due arrival date (for example, if your reservation is due for the 10th of July, you will be able to freely cancel or modify the reservation until the 4th at 11:59 pm). No modifications or cancellations will be accepted free of charge after that time. Modifications: They will be subject to our availability and minimum stay requirements. Please note that there will be no refunds in the event of early check-outs. In any case, if you need to modify or cancel your reservation, please do NOT wait until the last minute because it will be impossible for us to help you, as the more we approach the due arrival date, the less chances there will be of re-selling your cancelled nights. We are a small hostel, and we cannot afford having empty beds. Important: If you are arriving after 10pm, make sure to request the late-check-in service because all of the reservations that haven't arrived by that time will be considered a no-show and can be cancelled by the hostel. Deposits: Hostels cannot reimburse the deposits paid online since they are kept by the booking companies chosen by the guest. If you have any inquiries about this, you should contact the booking company. Credit cards: According to the booking conditions, a valid credit card is required in order to maintain the beds reserved. In the event the provided credit card doesn't work, the reservation can be cancelled by the hostel as there is no guarantee that the reservation will be honored.